The Aorus X7 Pro is an amazingly thin and light 17.3-inch gaming laptop that plays modern games with ease, but it suffers from some serious fan noise and heat issues. Upate: The Aorus X7 Pro is now available as a refreshed version with G-Sync. Check out Page 3 of this review for more on the Aorus X7 Pro-SYNC. Thin gaming laptops, like the Origin EVO15-S and Digital Storm Triton, have made us rethink our expectations of high-performance machines. Thanks to more efficient parts, including Intel's Haswell (and soon Broadwell-U) processors as well as Nvidia's Maxwell GPUs, manufacturers don't need to put rip-roaring components into a bulky notebook chassis. No device proves this point more than Gigabyte's Aorus X7 Pro. It's a 17.3-inch gaming laptop equipped with two Nvidia GeForce GTX 970M graphics cards working together in SLI, plus a beefy Intel Core i7 processor. And yet, the machine is less than an inch thick. On paper, the X7 Pro sits on equal footing with the Alienware 18 and MSI GT72 Dominator, but has Aorus managed to squeeze the same amount of gaming performance into a smaller package? The Aorus X7 Pro is an unfathomably thin gaming laptop, considering the two GPUs and high-end chips it comes packing. With the lid down, the laptop closes down to an astonishingly thin 0.9-inch silhouette. 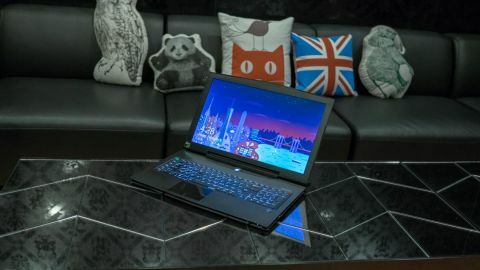 Compared to most other gaming 17-inch gaming laptops - with the exception of the even thinner Razer Blade Pro - you could almost mistake Aorus' offering for an oversized Ultrabook. The majority of the machine features a metal frame that makes up the screen lid, palm rest and surrounding keyboard deck as well as the laptop's underside. The only bits of the plastic include the bezel around the 17.3-inch screen as well as the sides of the laptop. You'll never really notice the difference between the two different materials, as Aorus has given the plastic bits a bespeckled paint job which closely resembles the anodized finish of the metal. The Aorus X7 Pro's design is a mix between a stealth bomber and a hyper car, which is made even cooler by a purely black and white color scheme. The laptop top lid features three sharp lines, including a prominent front beak. The extra detail adds a bird-like motif to the unit on top of Aorus' logo of an eagle, but it makes me worry that the paint will rub off faster because of this sharp edge. The front end of the machine also comes to a distinct point following the beak. Meanwhile, the laptop's inside panel features a sharp, angular vent grill that looks both futuristic and serves as an intake for the components inside. Aorus made doubly sure to make sure it's thin gaming machine stays well ventilated. The rear of the machine rises slightly to a rear vent bump, similar to the Asus ROG G750, which flares out with sculpted lines, similar to the rear exhaust of a hyper car. Along with the heat coming out the back, there are four vents cleverly built into the laptops sides. At the front, you'll also find intake vents that even wrap around the corners of the laptop. Each of the vents features little chevrons the help add support for the opening and add an extra bit of flair at the same time. What's more, there are even more slits for intake spread across the machine's underside. Despite all these measures to ensure maximum airflow, plus the passive heating though the laptop's metal bottom, the Aorus still regularly reaches skin-scorching temperatures during gaming sessions. The fans crank up to a distracting level and then only get even louder after that. On a full load, you can hear the fans spin up to a room-filling resonance from the turbulence inside the machine. The Aorus X7 Pro pushes out plenty of heat - there's no doubt about that - but the fan noise becomes so obnoxious you'll need to almost always wear a headphones during play sessions. This is also a notebook you'll strictly want to avoid putting on your lap, even if you're doing something as simple as watching a YouTube video.